Police have seized a drone which was being flown over the home of the Wimbledon tennis championships. 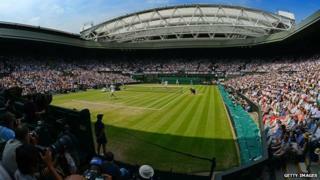 The Met Police said they were alerted to a man flying a drone over the All England Lawn Tennis Club, in south west London, from a nearby golf course at 08:37 BST. The force said it was an offence to fly a drone "within 50m of a structure". Officers are investigating the incident and enquiries are continuing, the Met said. Insp Roger Robinson, from Merton police, said: "Anyone intending to fly a drone should give prior consideration to the surrounding landscape and any structures or venues. "While it is not our intention to prevent people from enjoying the use of drones, it is important that regulations are adhered to." Britain's Andy Murray will begin his bid to reclaim the Wimbledon title when the tournament starts on 29 June.